Our Mission is to Bring 5 Million Australian Consumers Together Through RAPPS Reviews About Products Performance & Service Social Media Platform by the year 2020 by establishing the largest online network based on great values and respect. On average, consumers who receive good service, verbally tell 3 other people about their experience. Now magnify that figure through our website - you'll end up reaching 10's of thousands of consumers! But you knew that already, didn't you! You can never deny that your business does not agree that the following consumer wants are not important. As any business that does is a failing or already a failed business! When consumers lodge reviews, they assist consumers from all over Australia, to make informed decisions. Contact us at advertise@rappsreviews.com for all advertising opportunities. Just type Advertise in the subject line. Mobile device Apps are currently under construction, however, you can register your consumer reviews using the RAPPS Reviews About Products Performance & Service website NOW! 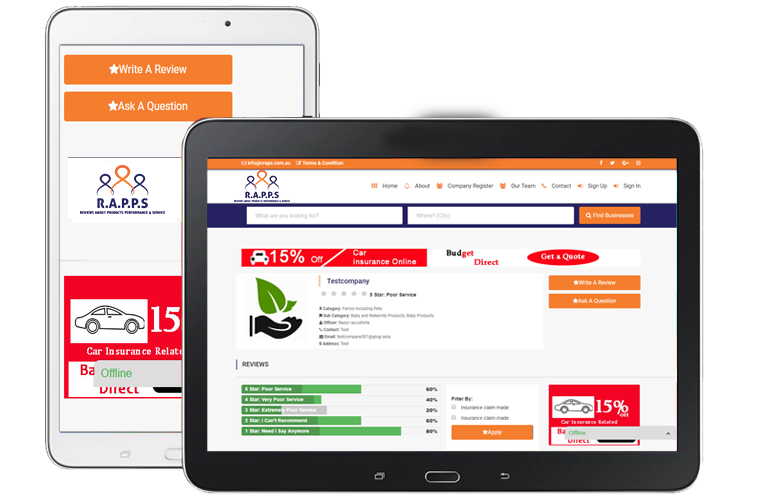 RAPPS Reviews is all about making it easier for you to find better customer service, so leave your reviews and help other consumers make better choices.